6 Digital Trends in Wealth Management Technology - Ignite Ltd.
One of the most important wealth management trends in the last few years can be summed up with a single word: Disruption. Fintech developers are bringing high technology to the world of high finance, and wealth management software is on the lips of every major player in the industry. Throwing away old ideas about the industry, innovators are leveraging automation, big data, and the cloud to offer lower fees, lower minimums, and larger returns. As the shepherds of this migration to a new techno-centric world, Fintech CTOs must constantly seek out more creative ways to serve their customers. Innovation in the software space is the key to success in the modern wealth management market, as customers grow ever more savvy to economics and technology both. Below, we’ll examine 6 of the latest trends in wealth management software development. One of the fundamental truths of today’s business world is that customer experience is king. Products and services, particularly big-ticket items like personal wealth management, need to feel personalized and relevant to the customer. Errors must be quickly addressed, information must be plentiful and attractively presented, and the customer must be able to help themselves online whenever possible. 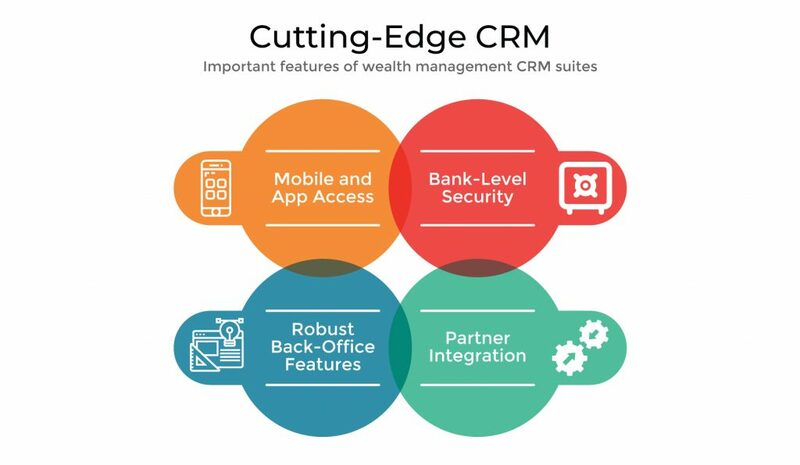 Here are the most important features that every wealth management Customer Relationship Management suite (CRM) must provide. Some are universal, while others are unique to this industry. Modern consumers spend more time on their phones than on their computers, and that goes for their financial management just as much as it does clothes shopping. It goes without saying that a wealth management provider has access to sensitive customer information. Security is crucial in every detail of customer interaction, from support messages to transactions. As with any customer-focused business, wealth management employees must be equipped to take care of customers. Scheduling, collaboration, sales lead management and analytics are all keys to success. Wealth management doesn’t happen in a vacuum. Seamless integrations with clients’ banks, independent financial advisors, and brokerages must be fast and secure. The AI revolution is real, and it’s set to affect wealth management services as much as any other industry. Although purely automated “robo-advisors” have failed to catch on, the technology is solid. An AI algorithm is perfectly capable of making good investment choices, and have resulted in excellent 2-year returns. The problem is one of perception. A wealth advisor can literally make or break the fortunes of their clients, and many people are understandably hesitant to place their life savings under the care of a piece of software. Wealth management firms are therefore finding success in a hybrid approach. A human wealth advisor can use AI as a tool, ensuring that a portfolio stays within risk tolerances and handling problems before they cause damage. In other words, the machine provides mathematically perfect investment advice, while the human can focus on offering a more personalized customer service experience. What could be better? There has yet to be developed a perfect application that combines all this information and functionality into one easy-to-use interface. The wildly disparate functionalities and security requirements make it quite a challenge. The need is only growing, as clients become savvier, and new information sources like social media have more of an effect on the market. The first Fintech developer to come up with a solution will be a leader in the market, though, and many are already trying. Look for more and more unified investment management suites to release over the next year. As with other industries, investment management has gone mobile. Nearly every major brokerage today offers a mobile app. Several next-gen brokerages have also sprung up that focus solely on Internet- and mobile-based investing. Acorns, Stash, and more are leveraging the power of the digital age to bring on more clients than ever before. To keep their edge, wealth advisors need to keep up. Although they may still prefer to do their business by phone, their clients most assuredly do not. Today’s advisor needs to be available via social media, email, text, and mobile app. Clients should and expect to be able to ask questions and receive answers in real-time across all these platforms. With the amount of money involved, advisors should oblige them. To do otherwise risks appearing behind the times, and many tech-savvy investors will soon conclude that they can manage their own portfolios using the new tools that appear every week. Distributed ledger technology offers amazing security and performance advantages over previous data management schemes. Its benefits extend to every aspect of the tech industry, and wealth management software is no exception. In fact, industry trends already point to blockchain. The technology eliminates the need for stock transaction intermediaries, allowing trades to settle in real-time. The Australian Stock Exchange is one of the first to embrace this change, announcing they will switch to blockchain over the next few years. When the move is complete, trades will be nearly instantaneous for Australian-listed stocks. There are plenty of other potential uses for DLT in the world of wealth management. The data security offered is unparalleled, making client onboarding a snap. Smart contracts could allow for strategy adjustments as fast as the market shifts. As cryptocurrency continues to gain mindshare outside the tech enthusiast bubble, they could even become a part of traditional investment portfolios. Someday, we might all be trading Bitcoin and Ethereum, or their successors, on the NYSE. Big data is a hot buzzword this year, and it’s clear why. Actionable analysis can be generated on a scale heretofore undreamt of, and the result is transformative in every sector of industry. In finance and investment advice, big data affects everything from individual portfolios to the economy itself. Wealth advisors can use social media and public databases to gain a better understanding of their clients, their goals and risk tolerances. 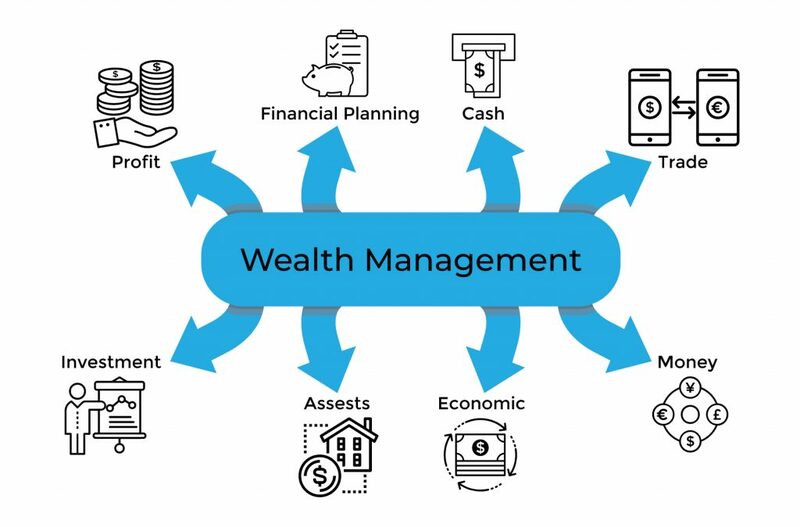 Wealth management trends can be analyzed across demographics, allowing advisors to better serve people in particular occupations, age groups, and more. Automation is made far more effective by big data analytics, allowing for smaller firms to take on more clients than ever before. In larger enterprises, top-level executives and analysts can use the technology to make effective decisions that apply to their entire client base. It’s a boon to the industry, and it’s already making huge inroads. All of these wealth management technology trends point to big changes in the industry. It’s a competitive field, and only by using the latest technology can any given company stay on top of their game. For Fintech firms, the opportunities are legion. There’s a whole world of challenges to be met, and rewards to be reaped by those who solve them. Digital trends in wealth management means that technology innovators will be in more demand than ever. Of course, all that innovation is useless without execution. And for execution, a strong development partner is key. Ignite is that partner. With over 150 successful projects in dozens of industries, we are ideally situated to bring your ideas to life. For a free consultation, contact us below. We’d love to speak with you.